This is probably the easiest of all cream sauces to prepare. Many years ago, I watched a chef on television as he was asked how to make fettuccine alfredo. His reply is as easy to remember as the sauce is to make. Just remember 1,1,1,1. That’s 1 pint of cream, 1 stick of butter, and 1 cup of parmesan cheese for 1 pound of fettuccine. For the life of me, I cannot remember who that chef was, but I haven’t forgotten his formula. Make no mistake, this is one rich dish of pasta and, as a result, you, too, may find the recipe results in too much fettuccine alfredo for two people, let alone one. Should that be the case, you can easily reduce the ingredients, just maintain their ratio — i.e., 1/2 pint of cream, 1/2 stick of butter, etc. Additionally, while it may be true that some cannot get enough salt in their food, this dish shouldn’t require much, if any, salt added to it. Parmesan cheese is relatively salty and it should bring enough salt to the dish for most palates. Lastly, with so much cream, butter, and cheese, this is a dish that most would reserve for special occasions or at least serve infrequently. 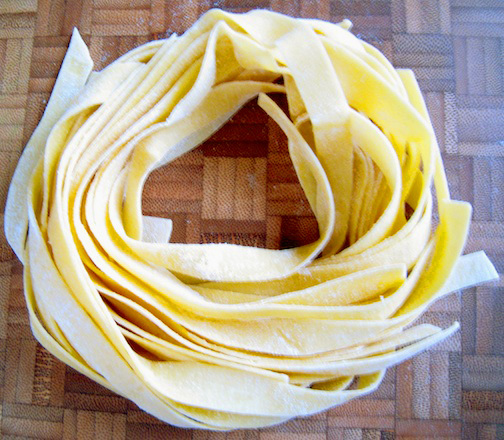 As such, do it right and prepare it using homemade or freshly made fettuccine. You won’t be disappointed. Place heavy cream in a medium sauce pan over med-low heat. Allow to reduce for about 10 minutes. If necessary, adjust heat so that the cream simmers without boiling over. Add butter to the slightly thickened cream and stir to melt & combine. Add cheese to the cream-butter mixture and stir. When the cheese is fully incorporated, the sauce will be thick and rich. Taste and, if necessary, season with salt and ground white pepper. Combine cream sauce with cooked fettuccine and mix until pasta is well-coated. Serve immediately and have additional grated parmesan cheese available at the table. The only variation that I employ — that doesn’t alter the original recipe too much — is to add garlic to the cream as it reduces. I will sometimes take a clove of garlic, crush it a bit, and place it in the cream. I remove it just before adding the butter and the result is an alfredo sauce with a hint of garlic. If you’re concerned that the garlic clove has fallen apart in the cream, pour the reduced cream through a sieve to remove any garlic bits before adding the butter and proceeding. This entry was posted in Pasta/Rice/Soups (Primi Piatti), Sauce/Gravy (Ragù/Sugo), Vegetarian and tagged Cooking, Food, Italian, Pasta, Recipes by ChgoJohn. Bookmark the permalink. Thanks. It really is that simple and the result is a rich, flavorful dish of pasta. It certainly has served me well over the years. My waist-line? Not so much. I love the recipe and of course your homemade pasta! This recipe is lighter than most, and not overdone; love it!